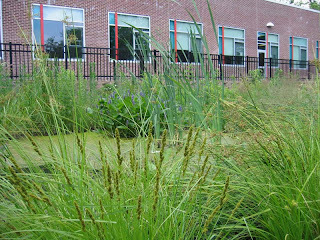 The ecolab at Princeton High School--actually an upscale stormwater detention basin transformed by teachers, students and grounds crew into a wetland--is now in its second season. This photo shows some fox sedges that were part of the initial planting. Behind them is one of the miniponds, with cattails springing up. The dark green leaves and blue flowers at the far side of the pond are pickerelweed, which will bloom throughout the summer. The image in the photo is one of soft, grassy vegetation next to water, beauty and repose. Relax and enjoy it, for the moment, because the next photo is of the same ecolab from another, less flattering angle. I put this photo in to show how deceptive a pretty picture of a garden can be. Here, the wetland looks more like a war zone, and in some ways it is. The carcasses of weeds lay desiccating on broad strips of black plastic layed down to suppress growth in areas not yet planted with natives. Though the ecolab is a wetland, it is still a garden, and actions taken this second season will determine whether all the native wildflowers and sedges planted the first year will thrive or be overwhelmed by (mostly exotic) weeds. Will a feel-good project (native plants, wetlands, schoolkids, butterflies, birdhouses) actually live up to its billing, or will it fade beneath a blanket of bindweed, horseweed and a wave of exotic grasses. With students and teachers mostly dispersed to farflung locales for the summer, the weeds have a perfect opportunity to prosper and turn good intentions into chaos. Most communities don't have a niche for someone with the knowledge and time to care for a planting like this, which is one reason why most of the urban landscape is a boring combination of trees and turf that offers little habitat for wildlife. That's where I come in, with support from the nonprofit Friends of Princeton Open Space and help from a summer intern from Princeton University. 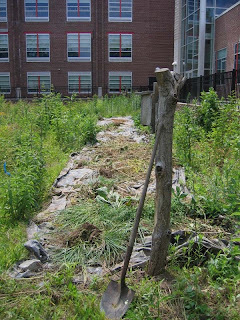 We've been augmenting the efforts of teacher Tim Anderson, spending a couple hours a week pulling weeds and adding to the initial planting with native Hibiscus, green bulrush and cutleaf coneflower grown from local seed. In this photo, you can see the challenge of figuring out what to pull and what to leave. The heart-shaped leaves on the left are of marsh marigold, a native that graced the wetland early this spring with yellow flowers. 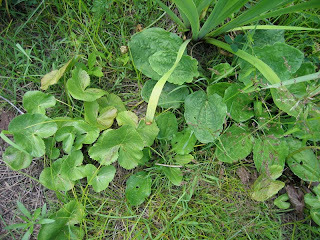 The oval leaves to the right are plantain, a common exotic weed that, like all the others, we try to pull before its seeds mature. The flat leaves at the top of the photo are blue flag iris, another native. Interestingly, the plant most people think of as iconic in wetlands--cattail--is one of the biggest threats to the ecolab, as its expansionist tendencies could easily crowd out all the less aggressive natives, reducing the site to a near monoculture. It sounds intimidating, but the work is made much easier by being strategic--pulling new cattails before they get firmly rooted, pulling exotic weeds when the ground is soft and before they produce seeds. 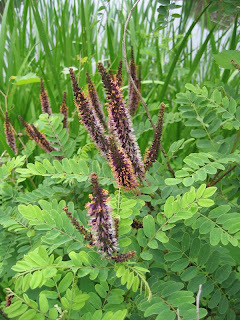 One of the conveniences of a wetland garden is that the soil is very often soft, so that weeds pull easily. Another plus is that the native wildflowers grow with such vigor, making weeding around them all the more rewarding. As this is written, the JoePyes are about to bloom--a good time to pay a visit. The ecolab wetland is on Walnut Street, across from Westminster Conservatory. Princeton's Autumn Hill Reservation is our next destination for a nature walk and plant inventory (see previous post for last week's). The preserve is on the eastern side of Princeton, on Herrontown Road just west of Snowden Lane. Head east from downtown on Nassau Street, take a left on Snowden (traffic light). Follow Snowden past the turnoffs for Smoyer Park and Herrontown Woods, then take a left where the road deadends at Herrontown Road. Autumn Hill Reservation parking is a short way up on the right. 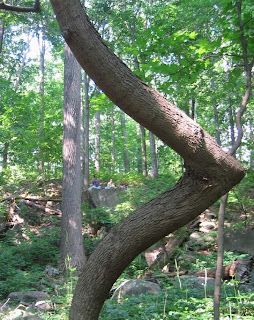 This summer, I'm leading walks Sunday afternoons in various nature preserves in Princeton. The goal is to better our acquaintance with the various preserves, and also to conduct plant inventories along the trails that will be published later this year in the Princeton Environmental Resource Inventory (ERI). The ERI is being updated for the first time since 1978. 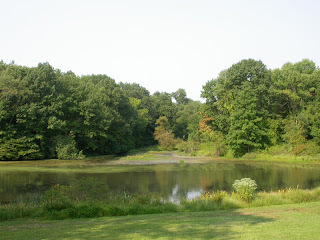 Our first outing was to Woodfield Reservation, located on the northwest side of town, near Princeton Day School. The preserve's trails are in excellent condition, thanks in particular to all the work that volunteer Andrew Love of nearby TenAcre has done over the years. There were many pleasant surprises along the way. 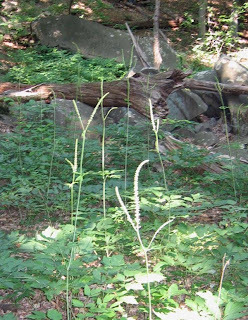 The first photo shows spires of black cohosh just about to bloom. For some reason, native species like maple-leaved Viburnum, a leguminous vine called Hog Peanut, and various ferns are more abundant here than at Mountain Lakes Preserve. There's also an impressive patch of maidenhair fern. A map (found on the web at njtrails.org) is very useful for navigating to Council Rock (framed by the elbowed tree in the photo), which lives up to its name, jutting out over a broad, rock-strewn valley--a great playscape for kids. Rising from the valley are towering tulip poplars and black gum. 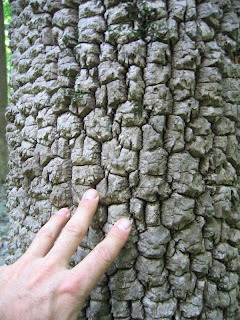 The photo shows black gum's distinctive bark. One native wildflower in the backyard garden showed unexpected vertical ambitions this spring. 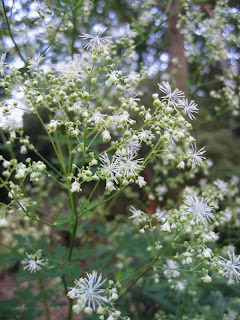 The Tall Meadow Rue is making its name sound like an understatement, having risen from the ground to a height of 9 feet. Its flowers are just opening, like a galazy of stars that attract a distinctively diminuitive bee to pollinate them. Also just opening are two kinds of yellow flower--Black-eyed Susan (Rudbeckia hirta) and Purple-Headed Sneezeweed (Helenium flexuosum). 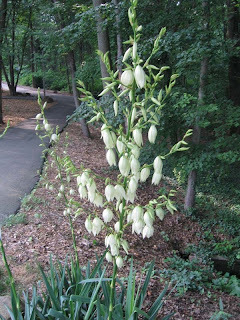 Another native blooming now is Adam's Needle (Yucca filamentosa), which looks like an import from the desert. It's striking white spires can be seen at the entryways of Pettoranello Gardens and Potts Park. pick ups, and make sure you have clean grills in your back yards. The bear is a 100-125 pound young male and has been non-aggressive. and make sure the bear knows you are there. Don't startle the bear. It will probably run away. Black Bear in the Borough! The Department of Public Safety is alerting community members about a reported sighting of a black bear in Princeton Borough. The bear was seen by Princeton Borough Police at about 9 a.m. today. In addition a bear sighting was reported in Princeton Township and Montgomery Township on Friday, June 6, 2008, in the evening hours. Princeton Borough Police, Princeton Township Police, the municipal Animal Control Officer, and the New Jersey Division of Wildlife Fish and Game were alerted to this report. The borough police reported the bear was seen on Cleveland Lane, Westcott Drive and Pardoe Road. It was last seen heading west by Mountain Avenue and Great Road. The bear did not come into contact with any person, nor did it present any threat. Do not approach the bear or attempt to feed it. If you see a bear, please contact the Princeton Borough Police, Princeton Township Police, the University's Department of Public Safety, or dial 911 and give the exact location of the animal. Leave the area calmly and slowly. One of the chief activities, perhaps the primary activity, of any avid plant lover and gardener is to kill plants--specifically those which are clearly determined to overwhelm the plants you love. Most people politely call it weeding. One of the greatest weeds of all has been moving into my yard from the rental next door. The landlord tried to get rid of it, but gave up. Last year, I decided to take it on, sharpened my sword (loppers), donned my armor, picked my moment and charged. Phase 1 was to cut every last stem at its base. 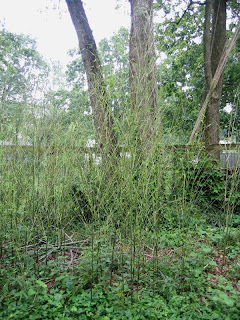 The bamboo played dead for a week, then sent multitudinous shoots rocketing up into the air. Rather than rush in with more loppering, I sat back and waited while the beast spent its energy on stems. Then, as the ten foot high stems began to send out leaves that could fuel the serpent's roots, I moved in with my loppers and again cut every last one down to the ground. The bamboo attempted no more grand growth before winter. This spring, however, it has again sent an army of shoots into the air, and again I waited as it invested in infrastructure. Then, just as it began to unveil its solar panels to draw energy from the sun (see photo), I cut the shoots at the ground. The strategy here, as with english ivy discussed in another post, is to starve the plant of energy. Plants metabolize constantly, which means they need energy to maintain their tissues. If deprived of leaves over a long enough period, a plant will eventually exhaust its energy reserves. We'll see what the bamboo tries next. Here's what's bloomin' in early June at Mountain Lakes Preserve and elsewhere in Princeton, shrubwise. On your left are the spires of Indigo Bush (Amorpha fruticosa), which grows along the banks of ponds, mostly, and was getting lots of attention from pollinators when I paid it a visit. I just learned that it is highly invasive in Hungary. But here it mixes well with other natives. 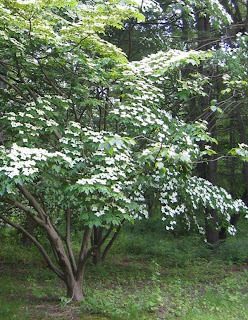 Bike the streets of Princeton and you'll see lots of Korean dogwoods (Cornus kousa) with 4-petaled blooms crowding their branches, sometimes so thick they look like snow. The one in the photo grows in front of Mountain Lakes House. Very pretty, and not invasive that I've noticed. The native flowering dogwood (Cornus florida), which produces excellent berries for fall migrants, blooms a few weeks earlier. 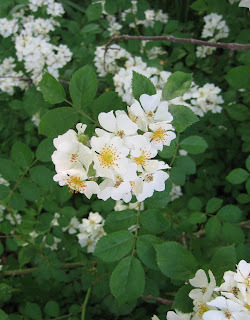 Learn to recognize Multiflora Rose and you'll start seeing it everywhere. It's part of the default landscape in town, sprouting up along fencelines, and does an altogether too good a job of crowding out native species in the local preserves. It was intentionally introduced to the U.S. to make "living" fences on farms, and has gone well beyond its intended role, having escaped to make most of our woods impenetrable. 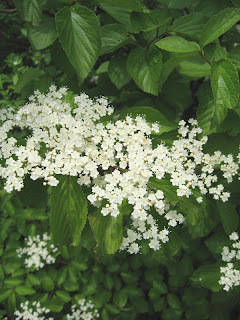 Since this is a Viburnum, I was hopeful it was a native, but it turns out to be Viburnum dilitatum, an ornamental that has invaded local woods. We're starting to remove it from Mountain Lakes Preserve, despite its attractive blooms. Please resist planting it in your yard. Whatever insects are around don't show much interest in any of these white flowers, for some reason. On Thursday, June 12, the Princeton Environmental Commission will host a picnic, followed by two presentations geared to the general public. The event will take place at the township's Mountain Lakes House, 57 Mountain Ave in Princeton. All are welcome. 6pm: An indoor/outdoor picnic on the patio and lawn overlooking the lakes. Children are welcome. Bring your own sandwiches and salads. The Environmental Commission will provide seating, entertainment, cold beverages, and dessert. 7pm: Presentation of the PEC's third annual Sustainable Princeton Leadership Awards. 7:30-8:30pm: Presentation of the draft Environmental Resource Inventory for the two Princetons. The environmental resource inventory brings together information about Princeton's watersheds, geology, rare species, climate and soils. It catalogs historic buildings, schools, demographics and transportation. Princeton's last resource inventory was in 1978, and was in great need of an update. The PEC paid for this environmental study using borough and township funds and a matching grant from The Association of NJ Environmental Commissions (ANJEC). The study is being carried out by the Delaware Valley Regional Planning Commission (DVRPC), with input from the PEC and borough/township staff. The public presentation will provide community members an opportunity to learn more about Princeton's natural and historical resources. One aspect that the inventory does not include is a detailed survey of plant and animal life. That's the part of it I'll be working on, and I welcome anyone in the community who has the knowledge and interest to help put together biological inventories of Princeton's parks and preserves. These can then be added to the publication later this year. Mountain Lakes House is just behind Pettoranello Gardens, across 206 from the Community Park fields. Take the long driveway at 57 Mountain Ave. and park in the gravel lot, to the left before you reach the house. For further information, please contact the PEC at 921-1359 or acriscit@princeton-township.nj.us.